The species is widespread but scattered in much of the southern half of Britain, very locally distributed further north. It is widespread in north-western and central Europe. 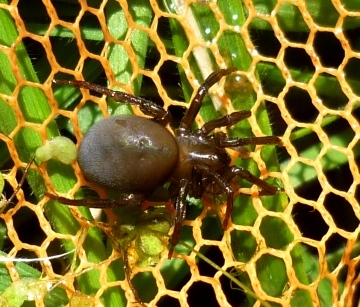 The water spider is found in clean, vegetated fresh water with little current e.g. ponds, lakes, dykes and canals where it lives submerged under water throughout most of its life. It creates an underwater silken cell that is filled with air from the surface. Prey is taken back to this retreat for consumption and the cell is also used for mating, egg-laying and over wintering. Occasionally the spider will feed at the surface and moulting normally takes place out of the water. The spider is adult throughout the year but most active from spring to late summer. The spider may be abundant in suitable habitat. It may be declining in some areas due to loss of habitat through pollution.